DutchAmsterdam.nl — Just minutes from Amsterdam’s bustling city center there’s a tranquil area that provides wonderful, panoramic views of the river IJ — the city’s waterfront. The so-called Noordwal (literally, North wall) — a waterside promenade of sorts — is one of my favorite ‘hidden’ spots in town. You won’t find many Amsterdam travel guide books that mention this off-the-beaten track location. Yet when tourists (and quite a few Amsterdammers I have introduced to this spot over the years) do visit Noordwal they really enjoy it. 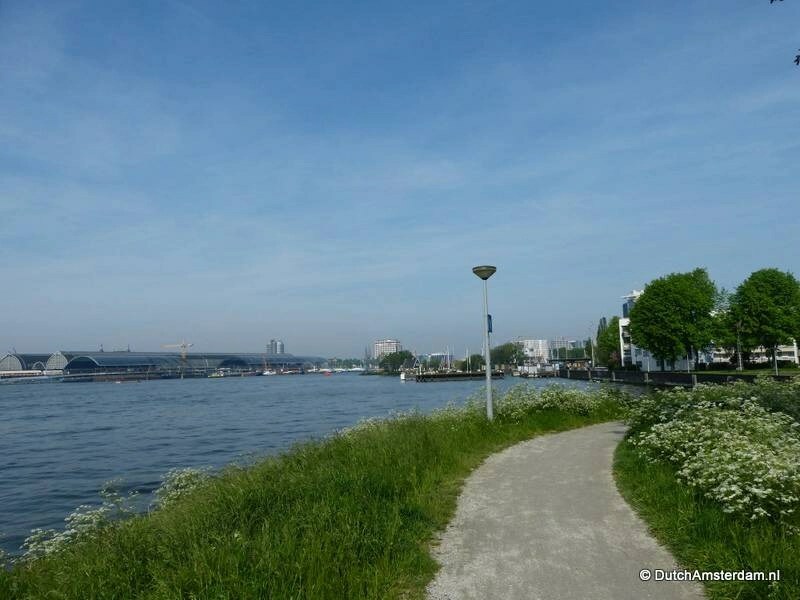 Small wonder: when the weather is good this is great place for a stroll along the busy IJ river. If you like boats, so much the better. 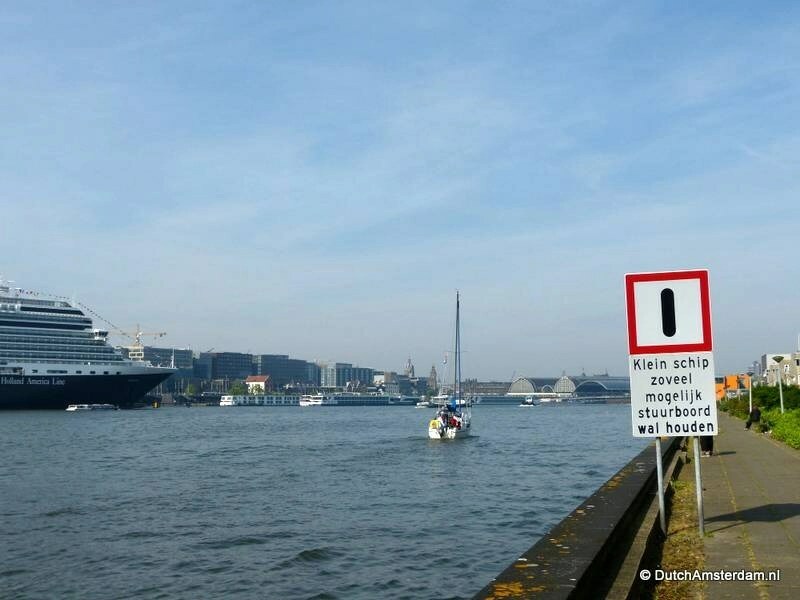 You’ll see lots of them: dinghies, sail boats, yachts, glass-topped canal tour boats, Port of Amsterdam tugs, police ships, barges and other cargo vessels, and — more often than not — even towering cruise ships. Along the way there are plenty of places to sit, as well as a nice café-restaurant and a top-notch Italian coffee kiosk. Noordwal is easy to get to. 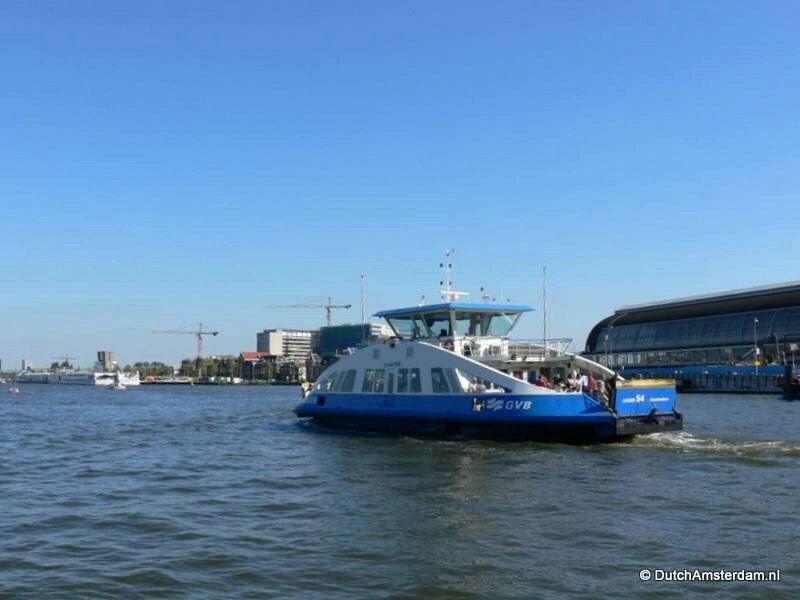 Just behind Central Station take the free ferry marked “IJplein.” It runs often enough that you don’t need to consult a schedule — every 15 minutes between 9:00 am and 3:00 pm, and more frequently before and after those times. The ferry ride takes just a couple of minutes, and if you’re like me you’ll thoroughly enjoy it. When I grew up my sister and I considered a trip with the ferry — going back and forth several times, in fact — to be a special treat, and even today I still think of it that way. Tip: stand on the open deck and have your camera ready. Bonus tip: don’t join the mad rush to the front of the ferry. You have a better chance for a good position on the after-deck. The construction work you see on both sides of the IJ just after departure is part of the controversial North-South metro line. At starboard (the two r’s remind you that’s the right-hand side) you see Central Station, while at leeboard the ferry passes Sixhaven, a yachting harbor. At Starboard again you usually seen a number of long, white passenger boats moored along the quay. Those are Rhine river cruisers that travel as far as Switzerland. Next you see the Muziekgebouw (literally, Music Building) — the most prominent music hall in the Netherlands. Attached to it is the world famous Bimhuis — the central spot for the Dutch jazz scene. Behind it is the eye-catching building of the Passenger Terminal Amsterdam and the quay where cruise ships — and at times naval vessels — arrive. Next to it is the luxurious Mövenpick Hotel, known for its eco-friendly way of operating. Meanwhile the ferry has almost arrived at its destination: IJplein. IJplein — literally IJ square — isn’t much to look at, but it has at least two redeeming qualities: Fantastic views across the water, and Al Ponte — the nearest thing to a genuine Italian espresso kiosk you’ll find in Amsterdam. Friends of Dutch Amsterdam know that we’re coffee connoisseurs. 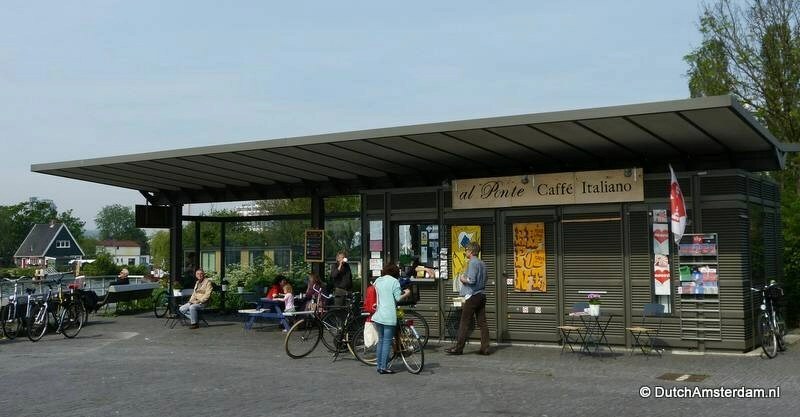 Throughout the site we tell people we think the coffee served at Al Ponte it the best coffee in Amsterdam. Now’s your chance to experience it for yourself. We can also heartily recommend the sandwiches served here. Fresh, Italian bread, lots of good ingredients, and generous enough to split — all at very decent prices. You could, of course, bring something to eat and drink from the supermarket or sandwich shops at Central Station, but you’d miss out on a nice experience and you really wouldn’t save any money in the process. Needless to say that Al Ponte — which offers outdoor seating only — is at its most enjoyable when the weather is good. Incidentally, IJplein is not just the name of the square, but also refers to the entire neighborhood. Noordwal starts at the path that leads to the bright orange waterside building, café-restaurant Wilhelmina-Dok. From there, simply follow the elevated footpath along the water. You’ll notice that this is not a prestigious-looking boulevard, but rather a somewhat plain path. It is divided from the road by rows of hedges, has a number of benches, and an uninspired cement wall on the waterside. What it’s got going for it are, as described earlier, the fantastic views across the IJ. Visitors tend to be surprised that this waterfront property is not home to a classier esplanada, along with houses that look more expensive. There’s a simple reason: In the eighties of the last century the City of Amsterdam built public housing at this location. 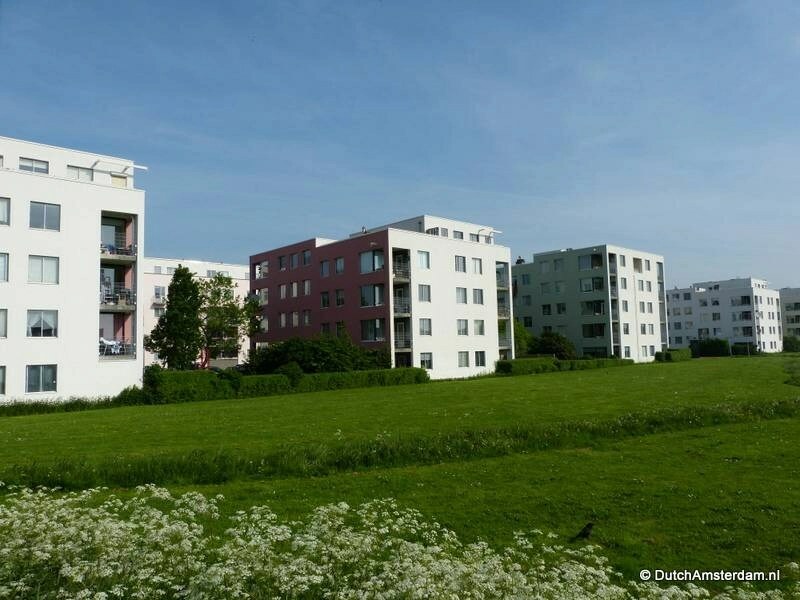 The buildings at IJplein and along Noordwal provide more than 1.300 social housing apartments. Formerly this area was home to heavy industry, primarily the Amsterdamsche Droogdok Maatschappij (ADM) — a ship-building and repair wharf. The street names in the area are reminders of that company: Koperslagerij (copper smith), Ketelmaketij (boiler factory), Het Dock (the dock), etcetera. ADM, establised in 1877 and located on this property since 1878, for economic reasons fused with Nederlandsche Dok en Scheepsbouw Maatschappij NV (NDSM) — another shipwharf — in 1978. But the new company — Nederlandse Scheepsbouw Maatschappij BV (NSM) — was declared bankrupt in 1985. When ADM sold its property to the city it stipulated that the ground should be used for public housing. The city agreed, though nowadays when renters move on the apartments are sold in the free sector. The urban plan for the area was designed by architect Rem Koolhaas of the Office of Metropolitan Architecture (Rotterdam). The houses are placed in such as way that as many homes as possible have a view of the IJ. The area was also home to the trash disposal plant ICOVA, and clothing factory Hollandia Kattenburg. Anyway… come here when the weather is good. The place is seldom too busy, the locals are friendly, and you’ll have a wonderful ‘off-the-beaten-path’ experience in Amsterdam.